(CNN) -- If one California lawmaker has his way, his cash-strapped state may have an arresting real estate listing on the market: San Quentin State Prison. 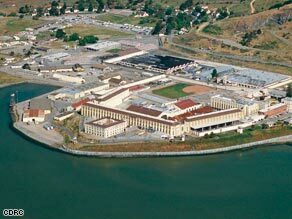 San Quentin prison houses more than 5,300 inmates, including Scott Peterson. State Sen. Jeff Denham is proposing selling the 432-acre prison, which offers a breathtaking view of San Francisco Bay, to garner money for California. "Our inmates just don't need an ocean view. Let's level it off," said Denham, a Republican. "Let's rebuild something for the community there and reap the benefit for the state by having that money come in," he added. Denham estimates that the property could sell for as much as $2 billion, even amid a down market. State Sen. Mark Leno, who chairs the state's public safety committee, said the committee was holding the proposal under a policy that allowed lawmakers and residents to give further thought to legislation that could exacerbate overcrowding in California's prisons. Taber said it could be brought up again this year or next. The prison houses more than 5,300 inmates, including Scott Peterson, according to the department of corrections. Previous versions of this article reported that Charles Manson and Sirhan Sirhan are among the inmates housed in San Quentin State Prison. Neither is still incarcerated there. However, even with the waterfront property, putting the prison on the market may be a hard sell, especially if a new prison had to be built. "This is a really good facility," Bob Sleppy of the California Department of Corrections said. "It's existing; it's operating; it's well-operated over the years by custody staff. It serves an immediate need." He said that building another facility to house the inmates might be troublesome. "Communities seldom welcome a new prison," he said, adding that constructing a prison to replace San Quentin could cost $2 billion, the very price tag Denham suggested. The idea of selling San Quentin, which opened its doors in 1852, has been raised before, but it never received much support because of California's chronic problem of overcrowded prisons. California is near 200 percent capacity in its prisons, and selling San Quentin could make the problem worse, said Leno, a Democrat. He said there were no precise numbers available showing the value of San Quentin's property or what it would cost to build a prison to replace it. "Again, we have no actual numbers right now," he said, adding, "I would guess, at best, it would come out a wash."
Real estate consultant Stephen Roulac said San Quentin's land could be used for condominiums, parks or community-type buildings. "We would love to see a performing arts center prospectively here, possibly a museum, possibly a tie-in with a university," he said. Lawmakers have approved $356 million to build a death row facility to replace the existing one at San Quentin, and some say that is another reason to consider selling the prison. "Does it make sense anymore in the year 2009 to continue to invest in expanding this prison facility on the most prime piece of real estate in Northern California, or should we finally start to think about some non-correctional uses for this unique property?" asked state Assembly member Jared Huffman, a Democrat. Denham has tried twice to pass legislation to sell San Quentin. His efforts in 2007 and in 2005 never made it out of committee, his office said.